no prior experience is necessary! Reserve Your Spot Today! Full Day Camp: $80 per day PRG Members get 10% off! Half Day Camp: $45 per day PRG Members get 10% off! PRG’s Fall Camp provide kids with more opportunities to climb in 2016! Bouldering & Top Rope instruction will be provided each day of camp. 2018 Fall Camp registration is not yet live. Check back soon! 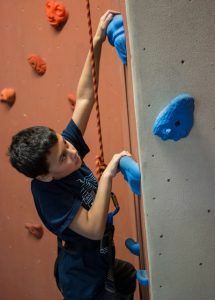 PRG’s Winter Camp teaches kids bouldering and top rope skills to make their climbing experience exciting, fun & challenging. It’s a great way to stay active during the cold winter months! 2018-19 Registration not live yet. Check back soon! Shake off the winter chill at PRG’s Spring Break Climbing Camp! 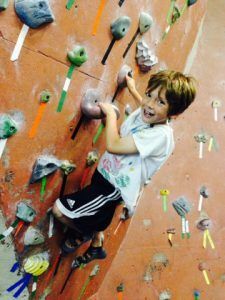 Each day, coaches at SBCC teach kids bouldering and top rope skills to make their climbing experience exciting, fun & challenging. 2019 Registration not live yet. Check back soon! All Seasonal Camp registrations require payment in full at the time of registration. Registration can be done online or by phone at 877-822-ROPE. To register online, find the program of your choice (i.e. Fall Winter, Spring or KDO Camps). Then click on the PRG location at which you’d like to register. You will be asked to Create a New Account, which you must do using your child’s name, then you may select the camp date(s) of your choice and finish signing up. If your child already has an account with us (with a valid email address), you will have the option to select from a list of similar names, or if you have already set up a user name and password, you may log in using those. At the top of the registration page make sure the Enrollments tab is selected. Below that are several drop down boxes. From left to right those boxes determine the location, enrollment type and other specific camp information that will allow you to search for the camp of your choice. When searching for camps, make sure the First box has the location you wish (Oaks, Coatesville, East Falls, or Wyncote), the Second and Third boxes say Summer Camp, and the Fourth box says All Instructors. This will give you a list of all Summer Camps at the location you have chosen. Should you have any trouble, please call 877-822-7673 for assistance. How Do I reserve a spot for more than one child? Create an account for yourself (the parent), then select the button “Add Family Member” and enter the required information for each child you wish to register. Then, when you choose the camp you wish to pay for, you will be given the option to select which child you are registering. Does my child need his/her own equipment? 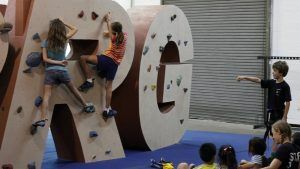 The PRG will provide climbing equipment free of charge for all Seasonal Camp participants. Climbers who have their own gear are welcome to bring it. What about food (i.e. snacks and lunch)? At Seasonal Camp days, both Full and Half Day climbers will be provided with morning snack and juice. Pizza lunch and juice will be served to Full Day climbers at noon. For further questions, or if your child has special dietary requirements, please e-mail kids@philarockgym.com. No, PRG’s Seasonal Camp programs require no prior climbing experience whatsoever! Do you have to be a PRG Member to participate ? No. 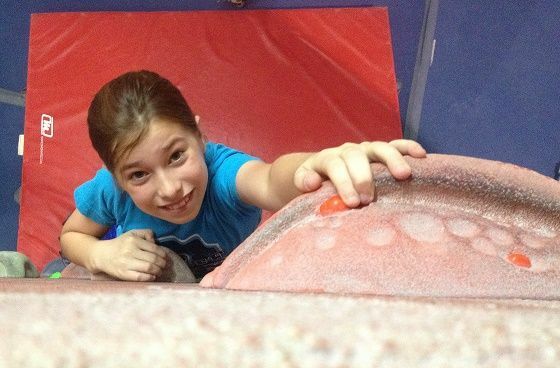 The cost of camp includes climbing time and equipment rental, as well as expert instruction. However, PRG Members enjoy discounts on all youth programs and camps at PRG! All participants must have a completed waiver form, signed by a parent or legal guardian if the participant is under 18. All participants are guests of the PRG and are required to obey all PRG rules. Seasonal Camp dues are refundable up to 2 weeks before the reserved date. Within or after that 2 week period, a credit for the full amount will be offered which does not expire and can be used toward other products or services at PRG (excluding private lesson and contract dues). To request a refund, please email kids@philarockgym.com. If you wish to switch to a different camp date or program, every effort will be made to accommodate at no additional cost. Please note: since each camp has a limited number of available spots, we cannot guarantee availability for a different date. To switch camp dates, please call our staff at 877.822.7673.